Pre-heat the Panini grill according to the manufacturer’s instructions. Place one tablespoon of mustard on to each slice of bread. Press the sandwich together and brush a light coating of olive oil on to the slices of bread. 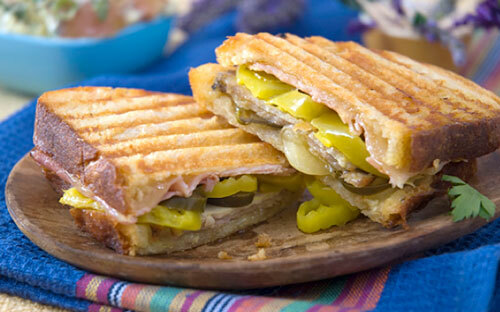 Place the sandwich in the Panini grill and cook for 5-6 minutes, or until the bread is golden brown and the cheese has melted.